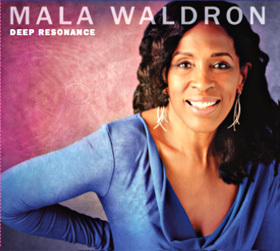 Mala Waldron’s 2016 album Deep Resonance has not yet been officially released yet and it is already creating quite a stir. There are very good reasons for this. 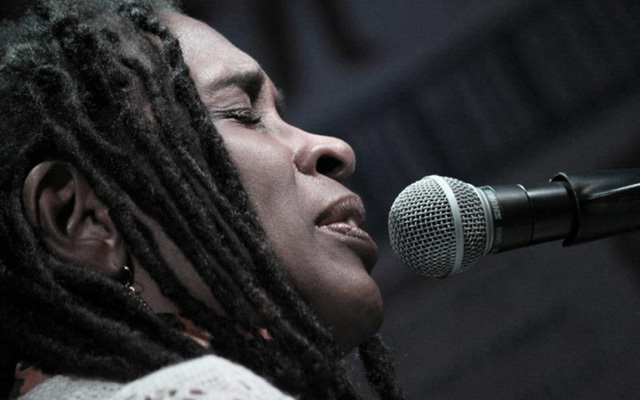 First of all, Mala Waldron is an accomplished vocalist. She has travelled the world performing for audiences from the USA to Russia. She plays piano rather well, accompanying herself as she sings in a silken contralto with a whispering vibrato so apt for the sensuous, soulful songs that she composes. She is a wonderful writer whose lyricism puts her in a class by herself. She tells stories which are riveting. In live as well studio settings Waldron performs in the intimacy of a duo and a trio but she has been heard by rapt audiences in Russia, with a large orchestra as well. Clearly Mala Waldron has a lot going for her. On Deep Resonance Waldron has collected just six tunes for the disc but five are her own compositions. The sixth is Joni Mitchell’s ‘Jericho,’ which has been completely reworked and dished out with elemental melancholy, heightened by the mesmerising cello played by the ineffable Akua Dixon. Elsewhere on ‘Life is Now’ and on ‘Feelin’ for You’ Waldron has been joined by the hugely talented Vincent Gardner. The trombonist is often featured by Wynton Marsalis’ Jazz at Lincoln Centre Orchestra. On the aforementioned tracks, Waldron adds great profundity to piano and voice with the inclusion of the trombone thus heightening the feeling of meditativeness. Other featured artists – bass flutist Allen Won, percussionist Jonathon Peretz and bassist Maurizio Rolli – also appear to be handpicked to what they bring to the narratives and they bring considerable beauty to their respective songs. This may be a very short album but you would be remiss if you did not acquire your copy. Waldron’s discs are a must for the discerning listener. She sings with a perfectly shaded mixture of power and melancholic sensitivity, her vocal phrasing neatly dovetailing with the contrapuntal eloquence of the trombone and percussion, the cello and bass flute and the fretless bass. The poetry of her music compares life to the wind, the wistful observation that beauty is that very life itself which unfolds in a myriad of situations, and each time she learns something more about that beauty. Waldron’s narratives navigate through dramatic contrasts, vivid imagery and wide leaps across a range of more than two and a half octaves – no mean feat when you’re in mostly duo setting with instruments of variable pitch and played with subtly changing rhythm as well. Clearly Mala Waldron is the artist to watch. Track List: Life is Now; Mon Amour; Jericho; I Know; Free as the Wind (Margot’s Song); Feelin’ for You. Personnel: Mala Waldron: all vocals, piano; Vincent Gardner: trombone (1, 6); Allen Won: bass flute (2, 5); Akua Dixon: cello (3); Jonathon Peretz: percussion (1, 5); Maurizio Rolli: fretless bass (4).